If the successive sets of Roman numerals, hyphens and numbers didn’t already give it away, Final Fantasy XIII-2 is not a game that intends to rock the foundation of one of Square Enix’s flagship series. 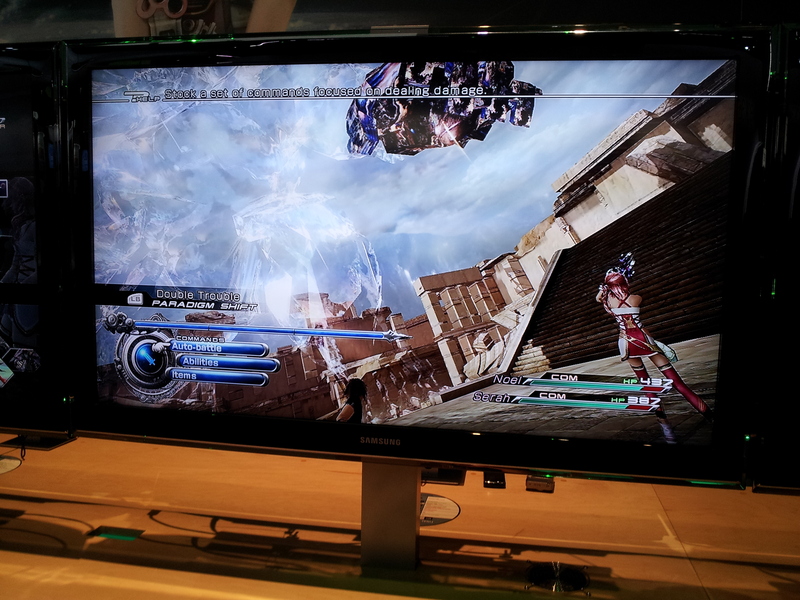 Instead, this year we’re getting a direct sequel to FF XIII that follows Serah, the younger sister of Lightning (the hero of FFXIII), as she embarks on her own quest to save the world. A few of the details revealed include a young kid named Noel that joins the group, as does a Moogle named Mog. Fans will remember Gran Pulse and enjoy the recreated city of New Bodhum. Square has also added more cinematic cutscenes and quicktime elements to this game. Question is, do they really enhance the experience? Turn-based battles return, and your foes are visible in the overworld before you fight. Using a new system of sneaking up on your enemy and timing your first hit, you can gain a major tactical advantage before your fight even begins. Not particularly fond of random battles, I found the new process a bit more strategic and fun. The actual fights haven’t changed much. Square’s Paradigm Shift battle system makes a return, but mostly you’ll spend your time hitting A to attack or diving deep into menu or item options, if you care to get more technical. My battle with the giant hand of Atlas was pretty much just a repeated tapping of the A button. The whole process is supposed to be simple, but it feels a lot like a shell covering a very complicated battle system that has incrementally evolved over the last 25 years. There’s a lot going on in the background, but Square holds most of it back, to the point where you can basically “Auto-battle” your way through most of the E3 demo. The biggest change to battles are quicktime events. Throughout each battle Square has sprinkled cutscenes filled with commands to “Press A” or tap “L and R” really fast. If you fail to interact with these cutscenes properly, you’ll lose some health. Succeed and you’ll deal some extra damage. It’s fun, but its a trendy solution. While games keep adding more and more cutscenes and complex story elements, I’m not so sure that making players tap the A button really keeps them engaged in the complex narrative. If a player wants to skip a cutscene, just let them. Square is taking cinematic customization seriously though. During any cutscene or battle, you can tilt and turn the camera a bit, customizing your view. Other additions also attempt to breathe life into the world. NPCs (non-player characters) all have voiced lines and more dialogue options than ever before, and the overworld has a number of additions like multiple walking paths and more realistic weather effects like rain. Representatives also pointed out new “live trigger” events, which happen around you, sometimes with a cutscene, sometimes without. A good example of this might be a pathway that opens up after you walk by it or a rock that falls. Overall, Final Fantasy XIII-2 has added some fun new elements to the series and nothing appears to really detract from the experience. Still, I can’t help but notice that this game felt a bit out of sync with many of the titles on display at E3. 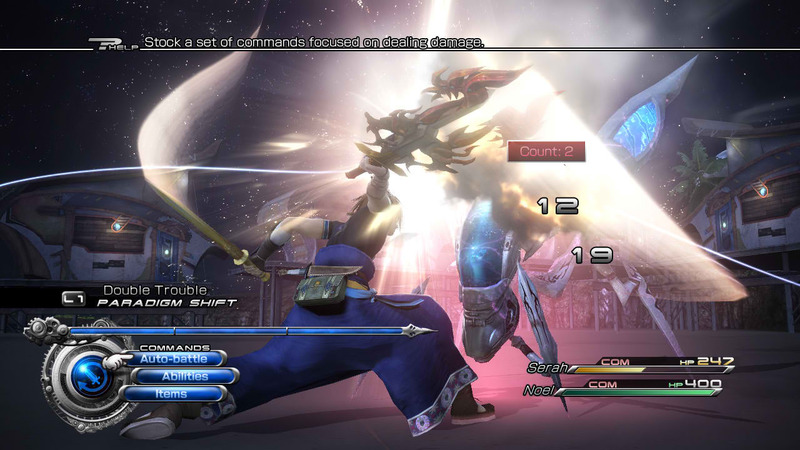 Both graphically and in gameplay, Final Fantasy is showing some age. Hopefully Final Fantasy XIV will give the series a needed breath of fresh air.